Michael C. Hall star of Dexter is a free man, after he and his ex-wife and co-star Jennifer Carpenter got divorced last Friday in Los Angeles, CA by Superior Court Judge John Sandoz. Is it me or is Michael C. Hall the only person to ever survive a relationship with Deborah Morgan?? The couple got married in 2008, but Deb--- Jennifer Carpenter was cited as saying they have irreconcilable differences and filed for divorce last summer. Dexter Morgan and Deborah Morgan are now officially over but the co-stars insist that they are going to remain friends forever. I’d hope they do considering Dexter is one of the most awesome shows on television, and they play brother and sister in the series. During a recent interview on E! 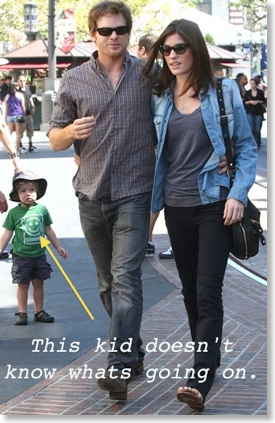 News Jennifer Carpenter said, “He is and always will be one of my best friends in the world. And just because te marriage ended doesn’t mean the love isn’t still there. We take very good care of each other and our cast - we always have - and I’m just really lucky. I know it’s not normal to think this way, but then again, I’m not normal -- but I thought it was a pretty interesting that they were husband and wife outside of the show, and then they were brother and sister on the show. They had intimite scenes with one another. I wonder what scene throughout the series was the hardest for them to act out. What scene do you think was the hardest for husband and wife to play as brother and sister?